Sea Turtles are some of Earth’s most ancient and majestic creatures. For over 100 million years, they have traversed the seas, surviving multiple mass extinctions and playing critical roles in maintaining healthy, marine food webs. Not only do these friendly animals captivate us as they peacefully glide through the ocean, but their personal journeys of survival are equally fascinating. Special thank you to our sponsors WQLN and the Regional Science Consortium! 11AM & 2PM Daily Starting April 27th. 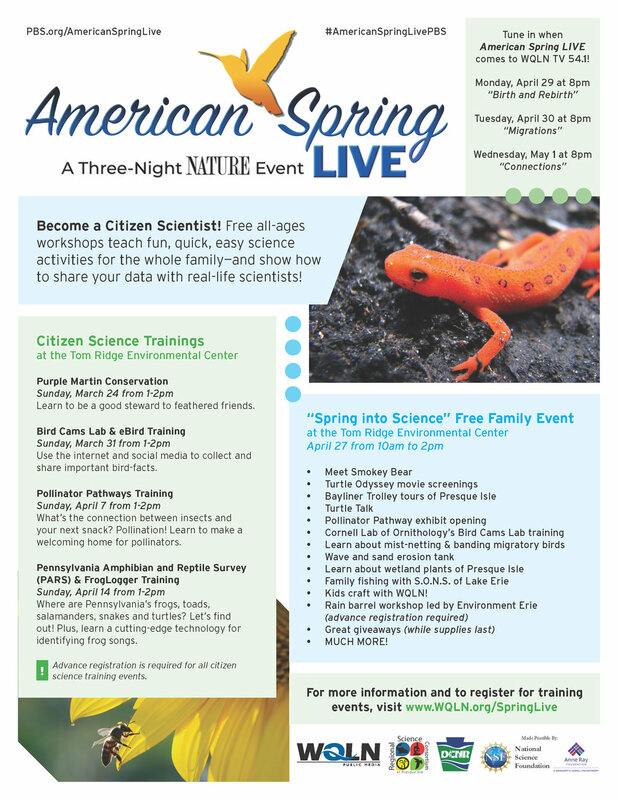 Special free showings opening day only with Spring Live! More info in the flyer below or on our events page. Sunset Cafe Easter Brunch on Sunday, April 21st, 2019 from 11AM - 2PM. Adults are $19.95 each, children $10.95 each, and children under age 3 are free. Prices are subject to 6% sales tax. For reservations call the Sunset Cafe at 814-833-5843. 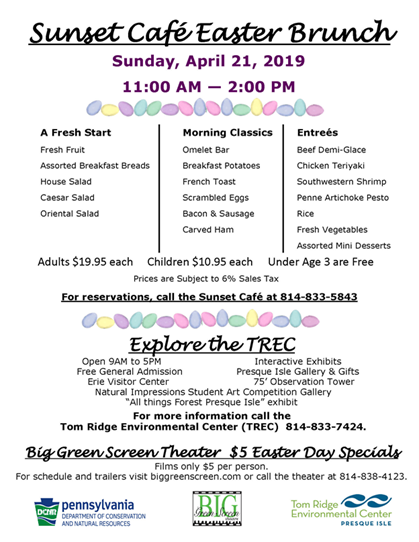 Afterwards stop by the Big Green Screen Theater which will have a $5 Easter Day Special! See a film for only $5 per person! We will have a new movie schedule starting April 27th featuring Turtle Odyssey and Mysteries of the Great Lakes! Every Saturday in January, February, and March you can see a featured WQLN PBS Kids series on the big screen! Showings are 10AM & 2PM. Craft or activity to follow the show, and admission is FREE! First come, first served. Episode schedule is below! Join us for fun activities and a FREE showing of Olaf’s Frozen Adventure at 10AM, 11AM, 12PM, and 1PM sponsored by First Energy! Showing is first come, first served. For more details check out the flyer below. 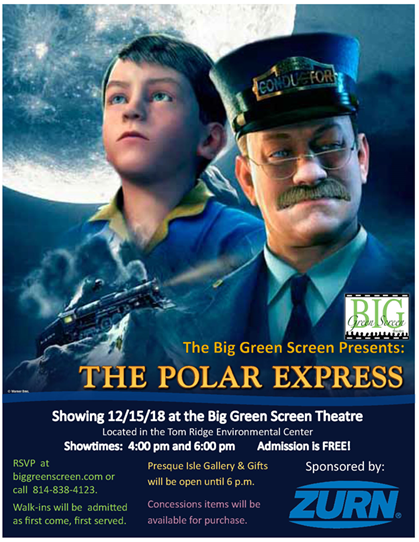 We are showing The Polar Express on Saturday, December 15th at 4PM and 6PM! This year’s holiday movie has free admission sponsored by ZURN, but spots are filling up fast! RSVP on the events page at BigGreenScreen.com/events. 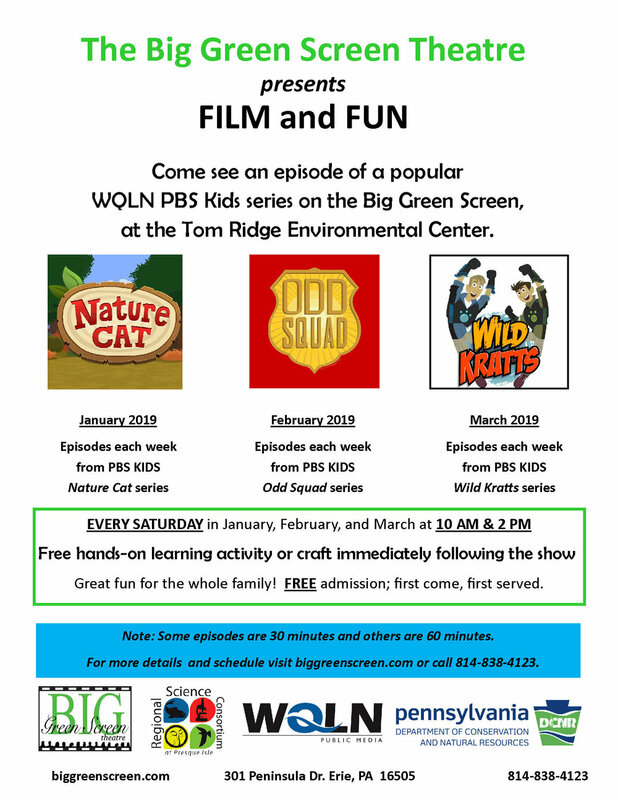 Every Saturday in January, February, and March you can see a featured WQLN PBS Kids series on the big screen! Showings are 10AM & 2PM. Craft or activity to follow the show, and admission is FREE! First come, first served. Episode schedule is coming soon! While you may have noticed our theater screen is not literally green, being ‘green’ is an important part of our organization's environmentally-friendly philosophy. Here are some of the things that make us the Big GREEN Screen. 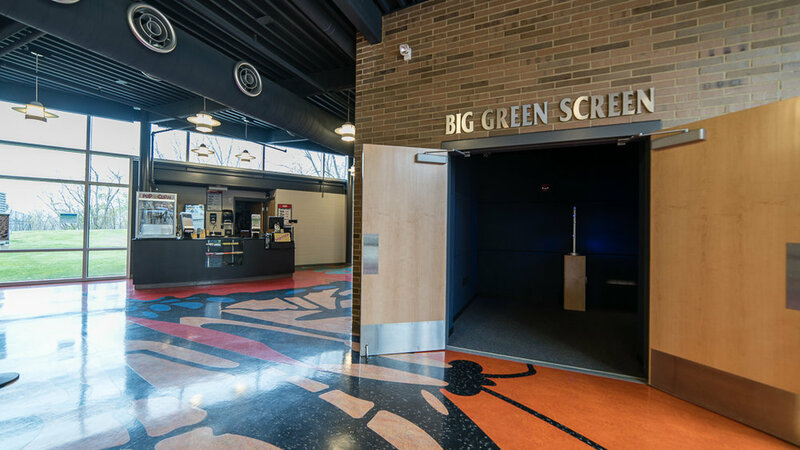 The Big Green Screen Theatre is housed in the Tom Ridge Environmental Center, a Leadership in Energy and Environmental Design (LEED) Silver designated building by the U.S. Green Building Council. Some of the features of the TREC include a permeable parking lot with native plant landscaping, low-flow toilets and bathroom sinks, and recycled material was used in construction when available. The TREC recently received the addition of a 10kW solar panel array and LED lighting fixtures in the observation tower and classrooms to reduce energy consumption. The Big Green Screen also takes specific steps to reduce waste at our concession stand. We recently began using American made Aardvark paper straws instead of plastic straws, and our drink cups and lids are also American made 100% compostable plant-based bioplastics from Greenware. The TREC and our new concession options allow us to fulfill our mission to provide public education and enrichment through educational programs and community outreach in an environmentally responsible manner.